Here’s an activity for those of you who dig agritourism and local farm tours and who want to get a behind-the-scenes look at hops production: Hop’n Blueberry Farm in Black Mountain, one of the first hop farms in the state of North Carolina, is offering one-hour specialty tours at 2pm every Saturday in April. The farm is about 20 minutes from the Inn on Mill Creek B&B. Hops are flowers and one of the basic ingredients in beer brewing, providing the bitter counterbalance to the sweetness of malt, while also acting as a preservative. 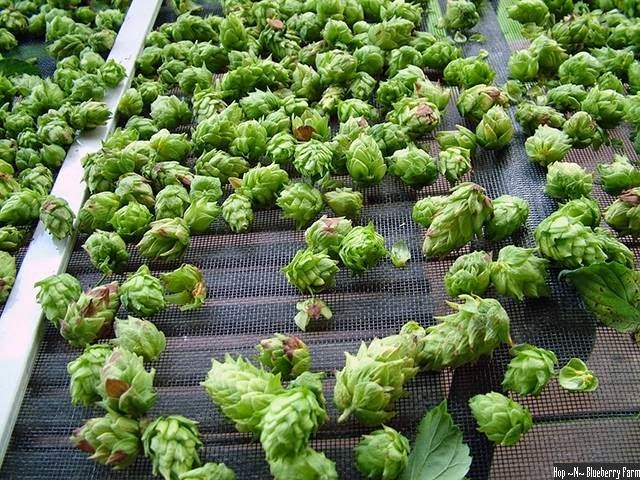 During the tour, you’ll learn how hops are grown and managed and see why Hop’n Blueberry Farm is a leader in hops production research in the state. The tour also includes samples of beer crafted by Black Mountain’s Lookout Brewing Company, using Hop’n Blueberry Farm’s hops. After the farm tour, head into Black Mountain and check out Lookout Brewing Company to see how their beer is made and see why when we say the best beers in the area are our local brews, we really mean it. For information on the tour or to get tickets, call Hop’n Blueberry’s Van Burnette at 828.664.1166. Van is the seventh generation to farm his family’s land at Hop’n Blueberry Farm. The farm is, of course, producing hops, and will begin harvesting blueberries in 2015. The farm is also actively involved in pollination research, especially involving the migration of Monarch butterflies, and has earned a designation as a Certified Native Pollination Habitat. This entry was posted in Uncategorized and tagged Black Mountain, festivals and special events, flora and fauna, outdoors, Spring by Inn on Mill Creek. Bookmark the permalink.